Adding the ShareThis plug-in to your blog can be a great asset to your blog’s design, but you need to customize it to work properly. The ShareThis plug-in allows visitors to your blog to share your posts easily through popular social media sites such as Facebook, Twitter, and LinkedIn. After you download and install the ShareThis plug-in, start in your WordPress dashboard, and then follow these steps. 1Choose Settings→ShareThis, then choose a display option. These styles range from showing the buttons as Large Icons to horizontal counting buttons that display how many times a post has been tweeted, shared on Facebook, and so on. The default buttons are a Facebook Share, Tweet, Email, and ShareThis button. The ShareThis button displays more sharing options when clicked. 2Add a Facebook Like, Google +1, Pinterest, or Instagram button to the default buttons. By default, all these are selected. To remove any, simply clear them. 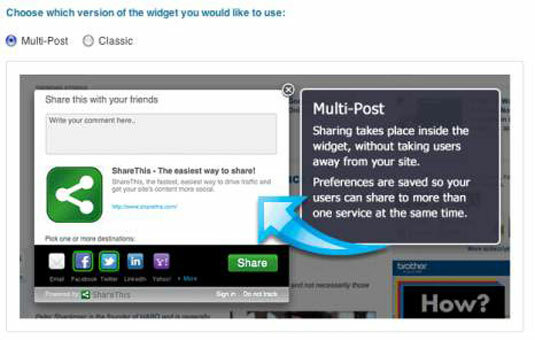 3Choose which version of the sharing widget you want to see. This choice is only for the green ShareThis button. Multi-Post allows a user to share to many social media platforms from a pop-up on your blog rather than leave your blog. 4Change the order of your buttons by clicking the Click to Change Order of Social Buttons or Modify List of Buttons link. This brings up a field with the names of all the buttons you’re currently using. Arrange the names into the order you want to display them. If you want to remove any of the original four default buttons, just delete the names of them here. 5Customize the Twitter sharing by clicking the Click to Add Extra Twitter Options link. Within this section, you have two options to customize. In the first field, enter your Twitter name so that it automatically adds via @NAME at the end of the tweet. Leaving it blank results in via @sharethis being added, so be sure to fill this in. By entering your Twitter name in the second field in this section, a page comes up after someone tweets with a suggestion to follow you. If you don’t add your name to this field, your readers are prompted to follow the ShareThis Twitter account. Don’t add the @ in front of your Twitter name for either of these fields. The plug-in already adds this for you. 6Click the Update ShareThis Options button.